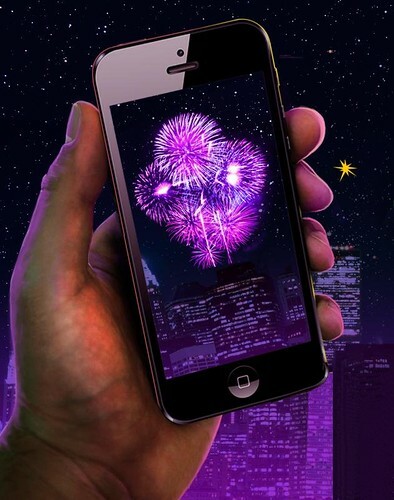 Epic tips on how to take awesome firework pictures with your iPhone. Not everybody has access to the latest DSLR camera to take photos of fireworks. We have therefore compiled a list of useful tips to enable you to take some great photos of fireworks using your iPhone or any other smartphone. Choose your location well. For a large professional fireworks display, you will need to ensure that you are quite far back from the display. As the firework breaks in a professional display are quite wide and big, the further away you are the more firework effects you will capture on your camera phone. Please make sure that you are out of the way of any trees, buildings, lamp posts and power lines which may obstruct your camera view. Any shaking whilst using your iPhone, even very slight shaking will blur your image. Please try to use a tripod, even a small hand-sized tripod will help. 3. Turn Off The Flash. Please make sure that you turn off the flash before you start to take your firework pictures. By turning off the flash you will help to reduce the blurring. You can turn off the flash by clicking the lightning bolt symbol in the corner of the screen. 4. Simply Make A Video. If you do not want the hassle of trying to capture great fireworks pictures, flip your iPhone horizontally and just simply record a video. Again if possible please try to record the video using a tripod. An iPhone is never going to take as good pictures as a fancy DSLR camera. Therefore take, as many fireworks pictures as possible using the tips we have given you, and although there may be bad pictures there will always be a few good ones you can use. You can also use awesome apps like Instagram to enhance your pictures through the many different filters they offer. Further advice on taking firework pictures can be found here. Over the last couple of years, the quality of camera phones has improved year on year and today’s mobile phone camera’s are as good, if not better than most standard digital camera’s which are above a couple of years old. The improvements in the phone camera’s and the available apps mean that you are able to take some really good quality images using special features never before seen on a phone camera. • Choose a location which gives the best vantage point for the fireworks but still maintaining a realistic view of surrounding buildings, structures or expanses of water as they enhance the effects and give depth and scale to images taken. • Either find a place to ensure you or the camera can be held completely still (like against a tree or vehicle) or invest in a tripod. This will help to avoid blurring and blobs on your images. • Turn off the flash – not needed as you will have enough light in the image itself. • Ensure that you have cleared as much memory space as possible. You know the ones: blurred pics of the lads night, the one of your dog smiling (no, he was grimacing) or last week’s Sunday roast – you really don’t want to be running out of memory space just as you are going to take pictures of the finale. • Get the ‘slow shutter cam app’. This allows control of the shutter speed. The recommended setting for fireworks is 5-30 but try a few variations – you may get some odd results but at least you will be getting some practice in. • Get the ‘fast camera app’. This will enable the camera on the phone to take up to 800 shots per minute instead of having to wait between shots. You may have 799 rubbish images but it’s that one perfect picture you are aiming for. • Start off shooting in portrait mode for the single bursts changing to landscape for the finale where the sky will be full of bursts.